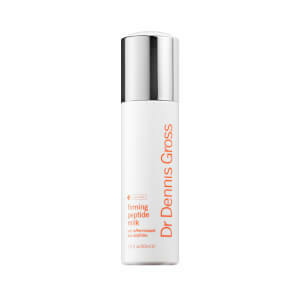 Understanding that even the most sensitive skin needs powerhouse ingredients to combat signs of aging, Dr Dennis Gross formulated the Ultra Gentle Daily Peel with 3 highly effective hydroxy acids that won’t irritate skin. Combining willow bark extract with lactic and mandelic acids, this gentle but potent treatment pad delivers precise exfoliation of extra-cellular cement and dead skin cells to reduce pore-size appearance and enhance radiance while calming, hydrating, and anti-aging ingredients restore beautiful, youthful-looking skin. Contains colloidal oatmeal and other nourishing botanicals to replenish and sooth fragile skin. No mechanical abrasion, just gentle detachment of dead skin cells to safely polish and encourage fresh skin without stripping the moisture barrier or causing irritation. 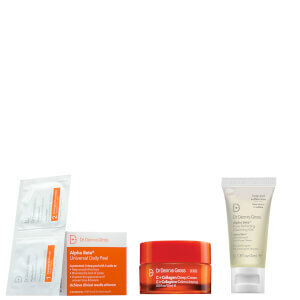 Ideal for fragile and sensitive skin. Firming Peptide Milk - Twist cap once to dose the correct amount of product. Unscrew cap and push the button to dispense exact dose onto fingertips. Gently massage into face, neck, and décolleté AM and/or PM. Follow with a moisturizer if needed (and a sunscreen in the AM). Ultra Gentle Peel:Massage step1padontoclean,dryskinuntilpadisnolongermoist.Waittwominutesbeforerepeatingwithstep2. To furtherenhanceresults, follow with a serum and moisturizer of your choice from Dr. Dennis Gross SkincareTM.To boost results, use Medi-Spa Peel weekly to enhance radiance, boost collagen, and firm skin.